Place roasting pan in oven while it is preheating. Cut pork into 4 steaks about 1 inch thick. Seasons steaks with salt. Set aside. Whisk together dressing ingredients – ginger, garlic, 1 tablespoon of the vinegar and 1 tablespoon of the amino acids in a medium bowl and set aside. Remove stalk from broccoli. Peel, trim and slice stalk into 1/4 inch planks. Divide florets into bite size pieces. Blanch stems and florets for about 10 seconds until bright green. Transfer to a rimmed baking sheet to cool. Pat broccoli dry and add to medium bowl with shallots, sesame seeds and 2 tablespoons of the oil. Season with salt. Transfer broccoli mixture to hot roasting pan, roasting 8-10 minutes until crisp tender. In a large cast iron skillet heat 1 tablespoon avocado oil over medium high heat. 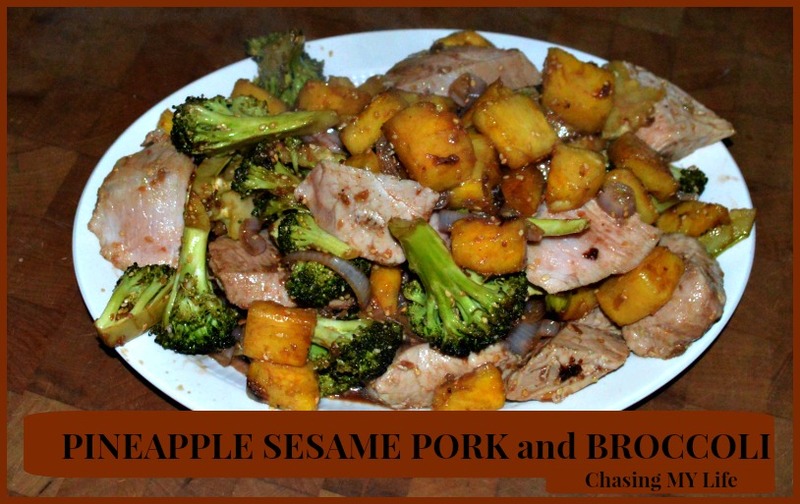 Cook pork, stirring frequently until a deep golden brown on all sides and cooked through, about 5-8 minutes. Transfer to cutting board and let rest 10 minutes. Pour off most the oil from the skillet. Add pineapple and 1 tablespoon of water, turning often until softened and starting to brown. Add butter and pork juices from the cutting board, tossing until sauce is glossy and emulsified. Stir in the remaining vinegar and amino acids. Season as needed with salt and pepper. Add broccoli mixture to reserved dressing , tossing to coat.